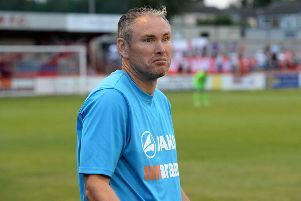 Banbury United boss Mike Ford says his players deserve the town’s support ahead of Saturday’s top-of-the-table clash with Winchester City. The Puritans are second in the Evo-Stik Southern League following Tuesday’s 1-0 victory at Tiverton Town where Mark Bell bagged the only goal in the Division One South & West clash. That was United’s second success over a top-ten side, having beaten North Leigh earlier this month. Few could have imagined the Puritans would be engaged in a top-two showdown after the opening day of the campaign when Swindon Supermarine ran out 3-0 winners. But the Puritans’ promotion push has gathered momentum since that early setback and they go into Saturday’s game on the back of a seven-match winning sequence. Ford said: “I hope there is a 500-plus crowd on Saturday because the players deserve it. Me, the committee, players and supporters would never have imagined we would be involved in a top-of-the-table clash in February when we started off in August. And, with adult admission halved to just £5, and under-16s free, club officials will also be hoping for a bumper attendance.